Loddon is a medium sized parish in the south of the county, and the River Chet marks the northern boundary of the parish. The name Loddon is an old name for the River Chet, which may derive from a Celtic word meaning ‘muddy stream’. Settlement in the parish is concentrated in the north, in the small town of Loddon, and throughout the rest of the parish are scattered farms, some grouped around the edges of former commons, like those close to Hales Green in the south of the parish. An intensive fieldwalking survey has revealed the development of settlement in Loddon from the prehistoric period onwards, and consequently the archaeological record for Loddon is both rich and diverse. Two prehistoric occupation sites have been identified in the parish. One of the two sites (NHER 17977) is located near the head of the Loddon Beck valley. Fieldwalking has recovered a large number of worked flints and a considerable quantity of Late Neolithic to Early Bronze Age pottery. The other site (NHER 16857) is located near Transport Lane on a knoll at the end of a ridge above the valley of the Loddon Beck. Evidence of occupation during the Late Neolithic and Early Bronze Age, including worked flints and fragments of pottery, has been found on the site. Both of these two sites retained their importance as a focus of settlement over a long period of time, stretching from the prehistoric period into the Early Saxon period. A dense concentration of many thousands of pot boilers has been recorded close to the site of the medieval village of Inglossa (NHER 10453). Although the pot boilers cannot be closely dated, it is possible that they date to the prehistoric period. Fieldwalking has recovered hundreds of prehistoric worked flints from the parish including prehistoric flint scrapers (NHER 1052, 17980, 19318), flakes (NHER 19322, 19487) and blades (NHER 19486, 19491). An excavation carried out by the NAU in 1996 on a site on Little Money Road (NHER 31941) recovered prehistoric flints and pot boilers. Other prehistoric finds from the parish include an Early Neolithic scraper and laurel leaf (NHER 31701), Neolithic polished axeheads (NHER 10448, 14288), flint arrowheads (NHER 12896, 20384), a flint chisel or pick (NHER 17780), a flint knife or sickle (NHER 21534), Beaker barbed and tanged arrowheads (NHER 10515, 21537) and late prehistoric pottery (NHER 16859, 19323, 20380, 21533). A possible Bronze Age ring ditch (NHER 17591) was found to be a natural feature when it was excavated in 2005 (NHER 42758). Three Iron Age settlements (NHER 16857, 17977, 17976) have been identified in Loddon, although problems of identification associated with Iron Age pottery may mean that Iron Age settlement was not limited to these three sites. All of the sites are located on a central belt of land where the valleys of several streams converge. Two of the sites (NHER 16857 and 17977) were occupied in the prehistoric period, and continued to be occupied until the Early Saxon period. Fieldwalking has recovered fragments of Iron Age pottery (NHER 11486, 19316, 19488, 20385) from elsewhere in the parish, and Iron Age terrets (NHER 17808), a miniature terret (NHER 17978) and a button or toggle (NHER 20378) have been found by metal detectorists. During the Roman period settlement continued to expand in the parish, and a number of settlements (NHER 20377, 20378, 21518, 21543) were established. The cropmark of a possible building is visible on aerial photographs on the site of a Roman settlement (NHER 13009), and the building has tentatively been dated to the Roman period. Roman building material, coins, and a silver ring have been found on the site. A number of small Roman settlements (NHER 16857, 16860, 17184, 17185, 17808, 17976, 17977, 17978, 17979) were strung out along a ridge in the centre of the parish. One of these settlements (NHER 17977) seems to have acted as a ‘central place’, as the sheltered site is situated on good soils within easy reach of a water supply. The site appears to have been a centre from which settlement expansion took place. The site of a possible Roman bath house (NHER 17982) has been identified during fieldwalking. Roman pottery and building material has been recovered from the site, which may have been associated with a Roman villa. Fragments of Roman pottery (including NHER 1051, 10515, 16858, 16859, 17187, 19322), coins (NHER 10516, 17806, 30191), brooches (NHER 17808, 19245, 33401) and metal finds including an escutcheon from a bucket (NHER 17808), a buckle (NHER 17978), a strap end (NHER 20378) and another strap end in the shape of an amphora (NHER 21872) have been found during fieldwalking and metal detecting. Settlement in the parish contracted during the Early Saxon period (NHER 16857, 17977), and in contrast to the Roman period only two settlement sites have been identified. These two sites had been continuously occupied since the prehistoric period, but they were abandoned after the Early Saxon period. Two Early Saxon inhumation cemeteries (NHER 17184, 17982, 21872) have been identified in the parish, and a number of Early Saxon brooches and other metal finds have been found by metal detectorists. Fieldwalking has recovered fragments of Early Saxon pottery (NHER 19316), and other Early Saxon brooches (NHER 16853, 17808, 17978, 39536) and a lovely example of an Early Saxon mount in the shape of a human mask with stylised birds (NHER 19487) have also been found. During the Middle Saxon period the focus of settlement began to gradually shift away from the central belt of land in the centre of the parish to sites that were closer to the River Chet. The reasons behind this shift are unclear, and there are many possible reasons, including the use of meadows and pastures close to the rivers as livestock husbandry became more important in the local economy, or the growing importance of the river for trade and communication. Several concentrations of Middle Saxon pottery recorded during fieldwalking are the remains of Middle Saxon settlements (NHER 17982, 21538, 21539, 21540, 21543). Middle Saxon finds from the parish include fragments of pottery (NHER 20386, 21512, 21537, 21538, 21541, 21542, 21544), a pin with dot and circle decoration (NHER 10517) and brooches (NHER 16854) found during fieldwalking and metal detecting. Two Late Saxon settlement sites (NHER 21531 and 21540) have been identified in the parish, and much of the Late Saxon settlement pattern is probably lost under the houses and gardens in Loddon itself. 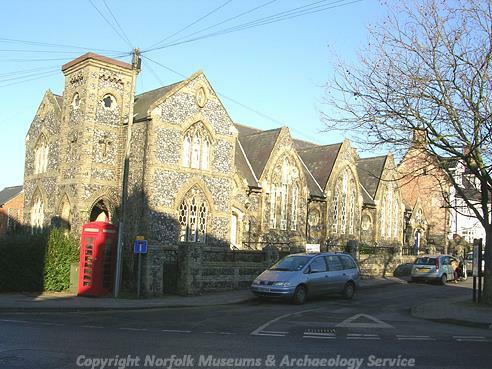 An excavation carried out by the NAU in 2000 on a site close to 1 High Street (NHER 35110) revealed the remains of a Late Saxon structure and ditches, which was later replaced by a medieval building. In the Domesday Book Loddon is recorded as a fairly substantial settlement, and the largest holding was in the hands of a man named Frodo, who held it from the Abbey of St Edmund. This holding included a church with sixty acres of land, a mill, woods and meadows. The Late Saxon village of Ingloss is also mentioned in the Domesday Book. It was held by Robert, son of Corbucion, who also had land in Loddon. Ingloss, which was also known as Golosa, was close to Manor Farm, and fieldwalking has recovered a substantial amount of Late Saxon and medieval pottery from the site. Fragments of Late Saxon pottery (NHER 20359, 20370, 20386, 21535, 21540), a strap fitting (NHER 13009) and a ring (NHER 17808) have been found, as well as a Viking spearhead with silver inlay (NHER 10518). During the medieval period population in the parish expanded, and over twenty medieval settlement sites (NHER 13009, 13496, 16857, 16860, 17187, 20373, 21539, 21540, 21541, 21544) were identified during fieldwalking. From the early medieval period onwards the edges of the commons and greens in the parish began to be settled. 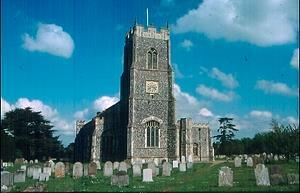 The largest green was Hales Green, in the south of the parish, followed by Stubbs Green, close to the town of Loddon. A number of these common-edge settlements (NHER 16851, 16852, 16853, 16854, 19314, 19315, 19488) have been revealed during fieldwalking. Unusually one settlement site (NHER 19324) appears to have been occupied from the late medieval period onwards, a time when settlement was normally shrinking and settlement sites were being abandoned. 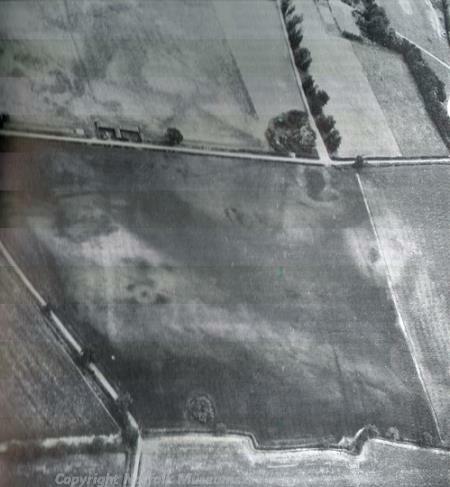 The earthworks of possible medieval house platforms (NHER 21869) are visible on a site close to the parish boundary with Mundham. The earthworks of a possible medieval toft (NHER 41748) were recorded in Hales Hall Wood during the Ancient Woodland Rapid Identification Survey in 2005. A medieval moat (NHER 28816) at Meadow Farm could be the site of Charles Hall that is mentioned in 14th century documents. Another medieval moated site (NHER 10533) near Stubbs Green is probably the site of the medieval and post medieval manor known as Stubbs Manor. Bacon’s Manor (NHER 28815) was situated close to Holy Trinity Church in Loddon. The medieval manorial buildings had vanished by the 17th century, but the foundations of buildings were found on the site in the 19th century. Holy Trinity Church (NHER 10538) dates mainly to the 15th century, and contains a 15th century ‘Seven Sacrament’ font and a 16th century painted screen depicting St William of Norwich, as well as several medieval brasses. St Mary’s Chapel (NHER 10532) was founded before 1289 and stood in the churchyard of Holy Trinity Church. The site of the chapel is now marked by a slight earthwork mound. Hales Hall (NHER 1053) was built by Sir James Hobart from 1478 onwards on the site of an earlier hall. The gatehouse range and the impressive brick barn are the only upstanding remains of the house. They stand to the east of the moated site where the main house was constructed. The foundations of the late 15th century house and octagonal corner turrets are visible on the moated platform that is divided by an earthwork bank, probably a garden terrace. There are several earthworks to the south and southeast of the barn. These include a hollow way and several ditched enclosures, probably all dating to the medieval period, and possibly related to an earlier Hall. Roger de Hales almost certainly had a house here in the 12th century, which was associated with a deer park and a chapel dedicated to St Andrew. The distinctive curving boundary of the medieval deer park (NHER 13496) can still be traced on modern maps, and at least one section of the boundary is marked with earthwork banks and ditches. A medieval settlement (NHER 16856) that was probably associated with the Hall has been identified to the north of the hall. A number of glazed tiles and other glazed fragments have been found, suggesting that this was the site of a kiln supplying high quality and ornate architectural decoration to Hales Hall, probably during the late medieval and early post medieval periods. Bugdon House (NHER 13872) dates to the 18th century, but the timber framed rear wing dates from between the late medieval period and the 16th century. The house contained original wall paintings and late 18th century Chinese-style wallpaper, fragments of which have preserved. The Swan Inn (NHER 13873) also appears to date from the 18th century, but the elegant brick façade conceals a late medieval timber framed building. Similarly, the 19th century frontage of numbers 15 to 21 Church Street (NHER 13874) conceals an excellent example of a late medieval timber framed building. Numbers 1 to 5 High Street (NHER 13876) was built in the late 16th century, and has a vaulted cellar, mullion and transom windows and reused medieval stonework. The Elms, Stubbs Green (NHER 25615), Bottom Cottage, Hales Green (NHER 35737), Beechgrove Farmhouse (NHER 44578) and Bush Farmhouse (NHER 10536) are all 17th century timber framed houses. 3 Market Place (NHER 19688) is also a 17th or 18th century timber framed building which contains a remarkable wall painting above one of the chimney pieces. The painting is probably a copy of Kirkpatrick's view of Norwich that was published in 1723, and the wall painting depicts houses, churches and Norwich Cathedral. To the left of the panorama are four full-length portraits of three men and a woman, perhaps the owners of the house. The barn behind the Fox and Hounds public house (NHER 13867), the barn at Loddon Hall (NHER 23059) and the barn at Hall Green Farm (NHER 28280) are all examples of 17th century timber framed agricultural buildings. Mornington House (NHER 13875), The Surgery (NHER 31873), 13 Beccles Road (NHER 44563) and The King’s Head (NHER 44586) also date to the 17th century, but they are all built in brick, rather than timber. Loddon also has a wealth of 18th and 19th century brick houses and shops along the High Street and the other streets in the town centre. The Old School (NHER 36179) was built in 1857 by J.S. Benest and A. Newman. The building is in squared and knapped flint with yellow brick dressings and has a southwest corner tower that is shown with a spire on old photographs. The main hall has triple lancet windows with hexagonal panes and cinquefoils. The school has now been converted into a library. The former Town Hall (NHER 44577) on Bridge Street was built in red brick in 1870 in the Jacobean style. The building has Dutch gables with finials, large moulded brick mullion and transom bay windows, and a central arched doorway with brick pilasters. St George’s Chapel (NHER 13871) is a Methodist Chapel that was built in 1893. The chapel has a large Perpendicular style east window and octagonal turrets. A smock mill (NHER 17154) is shown on Kittens Lane on Bryant’s map of 1826. 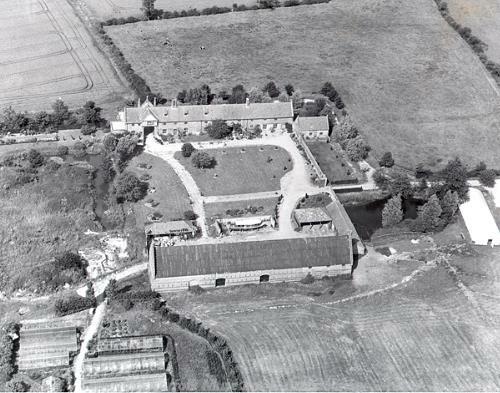 The mill was last used in 1889 but a watching brief carried out by the NAU in 1997 did not reveal any archaeological features relating to the mill. Loddon Watermill (NHER 10537) dates from the 18th century, and was converted into steam in the 1880s. The steam engine house and chimney are still standing to the rear of the mill. A World War Two pillbox with unusual loopholes (NHER 17497) stands near South End Farm, and another (NHER 17498) is just off Bridge Street. A pillbox (NHER 32725) formerly stood near the bridge, but was demolished in 1970 during a road-widening scheme. Two World War Two shelters (NHER 35982) used by the Home Guard are close to the Army Cadet Hall off High Bungay Road. It is unusual to find a pair of shelters, even though this was required by wartime regulations. The remains of a spigot mortar emplacement (NHER 40451) have survived on Old Market Green. During the Cold War the Royal Observer Corps had an underground post (NHER 21511) in operation on the outskirts of Loddon. 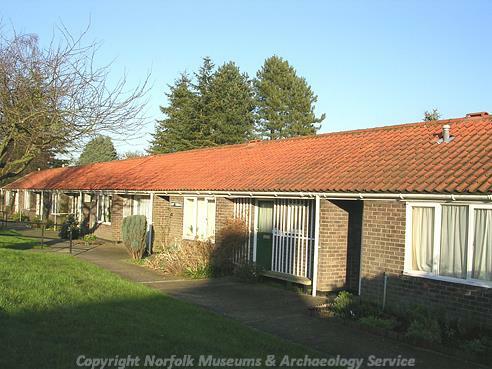 The houses and bungalows on Bungay Road and Davy Place (NHER 44603 to 44608) were built for the elderly by the Loddon Rural District Council in the 1960s, and are now listed buildings. The estate is a good example of a semi-urban 'picturesque' approach to design, and the scheme won the Ministry of Housing Medal in 1964 and a Civic Trust Award in 1965. Sarah Spooner (NLA), 4 July 2006.